Trasom Drains: Yea or Nay? Re: Trasom Drains: Yea or Nay? Good idea to have extra plugs. I like the idea of a dishing washer forming the flair! Thanks. One question: how long should I cut the tube so the flaring is sufficient? 1/4" longer than the transom thickness? More? Less? Do you even have to flare the tube or can you just cut it to be flush? I cut mine about 1/8" long with a tubing cutter. hoodman wrote: Do you even have to flare the tube or can you just cut it to be flush? Now THAT'S a thought worth pondering! If the tube is "in there & not going anywhere" [i.e. glued in with epoxy or 5200, etc. ), then why flare at all? If anything, the space under the flare is just a place to trap moisture, dirt, etc. Any downside to a flush cut? It's already flared on one side correct? Presumably the outboard side. The pressure of the water from the boat floating pushes it in. That said, they're only about 6" below the waterline, so the water pressure is only about 0.22 psi over ambient....which I would suspect does very little to keep it in place. I drilled some 1" holes in scrap Sapele and made some test fits. Practice makes perfect, right? I measured, verified & marked "the spot" on the transom. Then I measured again. I put a sharp 1" forstner bit in my drill. I sat behind the boat on the ground, got good & comfy. ....and I just couldn't do it. Call it "risk vs. reward", but I'm just not convinced this isn't an open door to leaks & rot, no matter how careful I am. I decided against them, too... even on a small boat like the Utility. As I came to see it, the potential problems far outweighed a little convenience. 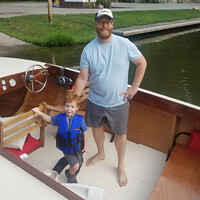 If you decide against them, I'd recommend keeping the bilge area accessible (especially at the transom) so that you can sponge out whatever the bilge pumps don't get. Your boat being more open will be easier to monitor and clean out. More enclosed boats would benefit more with the drains. But a proper installation would also be fine. Many wood boats, and fiberglass boats with wood core transoms, have rot around the drain plug, whether the owner knows it, or not. Probably, nearly all older boats have that issue. I too agonized over this decision with my Zip build, but ended up nay. There are pros/cons either way. For me the biggest reason I didn't was that in other boats I have owned the hole wasn't quite on the bottom, so I had to dry the boat out with a sponge/towel anyway. I did not have confidence/courage that I could get two of them drilled well enough for the tube to fit well without interfering with screws/keel/etc and still be on the bottom. Finally, I decided I could always drill one later if I changed my mind. Had I went with the hole, it would have been really nice to have been able to hose out the epoxy dust after sanding the insides during the build! Instead I had to use the shop vac and a bucket/towel. Kind of depends on how you use your boat, for me drains are needed. Between kids and dog dragging water up the swim ladder, spray over the hood or hosing her down at the car wash, I need drains to get all that water out. I’m lazy too, sucking out the water with a shop-Vac works great but I’m too tired for that after being on the water all day. Mark-NJ wrote: I like the idea of a dishing washer forming the flair! Thanks. How does a dishwasher form a flair? You put it on potscrubber mode.